WHAT IS EVENT BASED VIDEO? We know you have heard of in-cab video or dashcam solutions, but Vestige View is more than that. Vestige View Event Based Video is a complete incident camera solution for your fleet and other mobile assets. Combined with our Data Monitoring Platform (DMP) it is a perfect solution that fits the needs of many industries and applications. HD cameras capture clear video and images of interior & exterior of the vehicle. Event Based Video also allows you to monitor location, driving route, vehicle speed, and more. Detailed driver data is collected and stored in the DMP platform. This allows you to know if your drivers are practicing safe driving, review accident data, and protects from false insurance claims. Protect your business from cash-for-crash insurance claims, false or exaggerated whiplash claims, conflicting reports, and slow or unreasonable claims processes. The Vestige View Event Based Video Solution is not your average dashcam. It is an advanced incident camera equipped with powerful instant video transmission and telematics data. Research shows trucks and commercial fleets are much less likely to be at fault in an accident, but they pay most claims as if they are at fault. Vestige View sets the record straight and saves fleets from expensive insurance claims. Our Event Based Video Solution was created to provide evidence of events leading up to, and during, a road accident by providing instant notifications & video in less than 60 seconds. This can help protect a driver from any issues faced on the road. 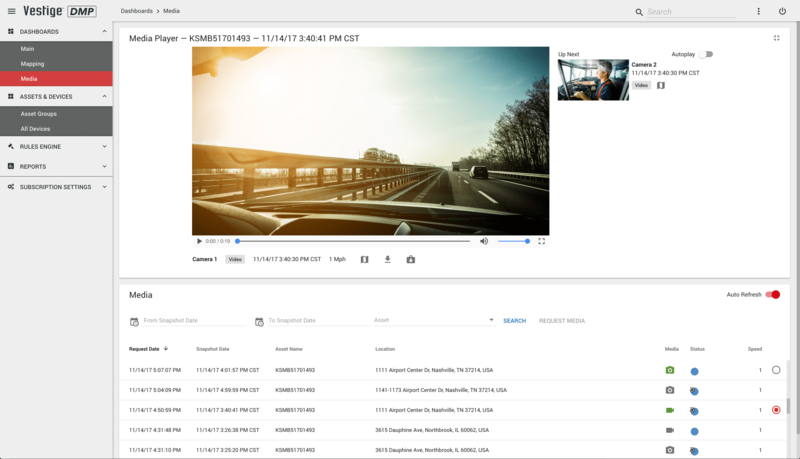 With Event Based Video you will have access to Advanced Analysis Software, Printable Event Reports, Camera History for up to 30 Days, 24/7 Live Driver Feed, Incident Alerts, & More. Event Based Video is your most effective tool for fighting and dismissing insurance claims against your fleet. With Event Based Video you can protect yourself and your business from cash -for-crash claims, fraud accidents false or exaggerated whiplash claims, conflicting reports, and slow or unreasonable claims processes. You will have access to actual Road Events such as poor & uneconomical driving behaviors. Our videos are never filtered through by a third party. You will receive all incident videos so you can decide for yourself what is important. With Event Based Video you can protect yourself and your business from cash-for-crash claims, fraud accidents, false or exaggerated whiplash claims, conflicting reports, and slow or unreasonable claims processes. You will have access to actual road events such as poor & uneconomical driving behaviors. You are in complete control. Unlike standard in-cab video solutions, Vestige View allows you to set up customizable alerts. You can set alerts for bad driving behaviors, such as hard braking and speed exceptions, to increase your fleet safety. If a collision does occur the video of the accident is automatically uploaded to the portal for you to review. You will also receive alerts by email and text that will contain the video of the accident in less than a minute. You can also stream live video on demand to monitor if drivers are driving safely and within compliance. It is easy to get started with Vestige View Event Based Video. It can work side-by-side with any GPS tracking solution and there is no up-front equipment costs. You have the power to choose if you would like to purchase or lease your Vestige View cameras. We offer flexible contract lengths to help perfectly suit your business needs. See how Event Based Video can reduce collision costs, overall accidents, improve employee monitoring, or any other solution you can think of. Want to request a free demo? Have any questions or comments? Fill out the contact form and we will be in touch with you shortly.